I hope everyone had a happy Leap Year Day. Ever wonder why we have Leap Year? I think I heard someone say that the earth takes 364 1/4 days to go around the sun, so every four years, we get an extra day. Please correct me if I'm wrong, but I know that it's something like that. Now that we're all just a smidge smarter than we were before coming to my blog, don 't we feel better? I do. I love learning new things. Of course, lately I don't seem to remember these wonderful new things for very long. Have you checked out the links over on the right side of this blog? 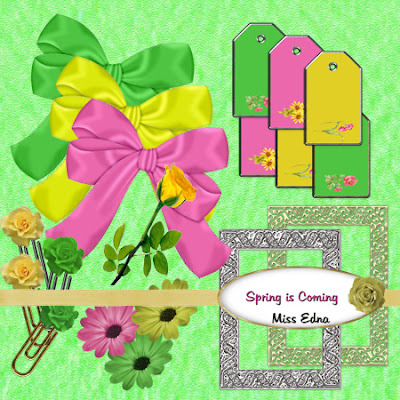 There are some wonderful new scrapbooking kits coming out now for Spring and Easter. Do yourself a favor and go check them out. Tonight, I'll give you a link for a QP that I made with Snow Raven's "Dreaming of Spring" kit. Well, today I finally decided on the contractor to do my roof. And, of course he lightened my pocket just a tad bit before he went on his merry way. The good news is that my roof won't leak when he gets done with it. I've almost finished my homework for the final class in this session. Just one more little ribbon, and I'll be done. Sounds easy, huh? That's what I thought too. Wrong!! Just by overlooking one tiny little step in the process, and you end up with something really ugly. Yup! I got me an ugly ribbon, and now I have to try again. 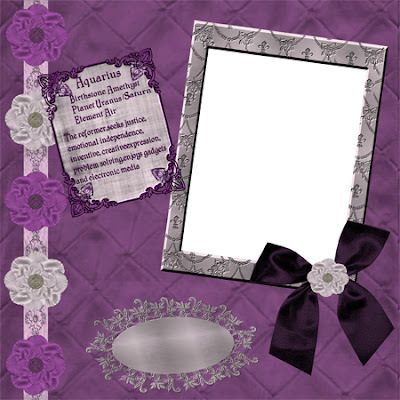 Today I'll share a layout I did for the Scraplift Challenge at GDS (see address at right). The challenges really are a lot of fun. Click on the link and have a try at it. 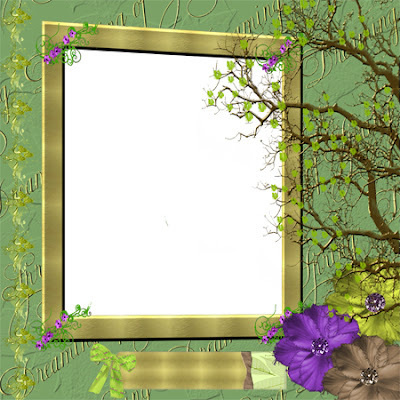 Credits: Background, frame, flowers from GST kit "Heart Throb." I've been gone a bit, but I've actually been very busy doing who knows what. I start something and the next thing you know, three days have gone by. One thing I do know, I have to either put more memory in my PC, or I have to take a lot of stuff out of it. The poor thing is moving so slowly these days. Up to now, I couldn't back things up onto DVD and remove them from the PC because my drive went bad. But now it's fixed, and I can slowly start removing a lot of my files onto DVD's. I heard from my friend, Mary Ann, and it was nice to hear that her hand is definitely on the mend. A long slow process, but attainable. That's it for tonight. 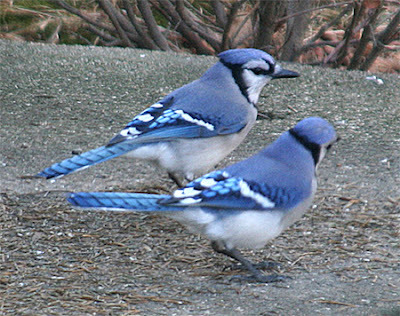 I thought I would share another Blue Jay picture. This one shows the pair of them. I never knew that they traveled in pairs, but these two do. Just checking the calendar, and do you realize that it's almost Easter? I don't recall time flying by this fast when I was much younger. It must be an "elder" thing. I'll have to step up up the pace with the Easter kit I'm working on. Meanwhile, the homework keeps on a-coming. But I love it. I'm just starting the last week of Beginning Photoshop, and I've already learned some great new things. Intermediate starts next, so I'll sign up for that this week. I'm off, it's medicine time at our house. Tootsie knows it too, and she's in hiding. 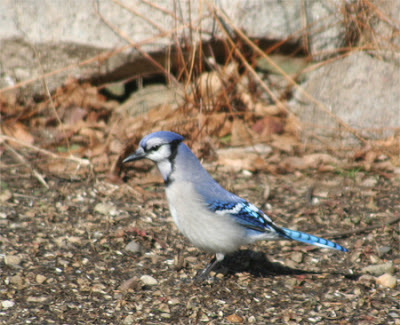 Tonight, I'll share a picture I took of a Blue Jay. They're really beautiful birds. Today will be quick, I have to get ready to go to work. 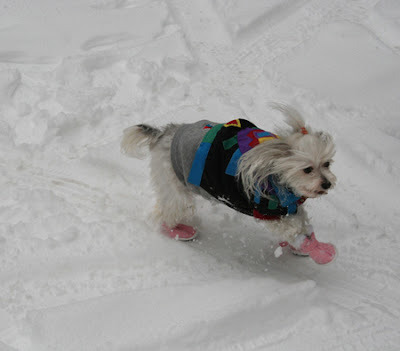 However, I did want to share a cute picture of Tootsie trying out her new boots in the snow. Also, I'll give you the link for a QP made from Snow Raven's "Glow of Garnet" kit. 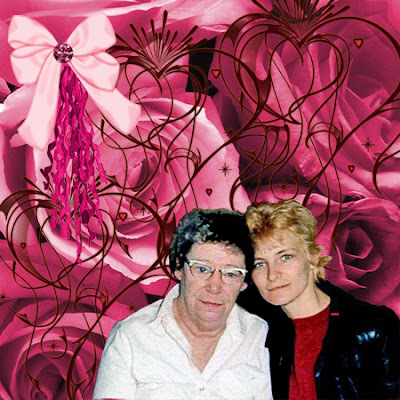 Here's the link for "Glow of Garnet." Finally finished all the homework (for this week), and now I can play for a day. Got to start thinking of the next new kit. I got a note from Snow Raven about a sale at "Gotta Pixel." Because it's leap year, they're having a sale - everything 29% off. She spent a bunch of money, and then of course, I did too. It's snowing like crazy here. My poor brother has shovelled it all up twice, and now it's all covered up again. There's a song out "Winner At A Losing Game." Reminds me of shovelling snow. 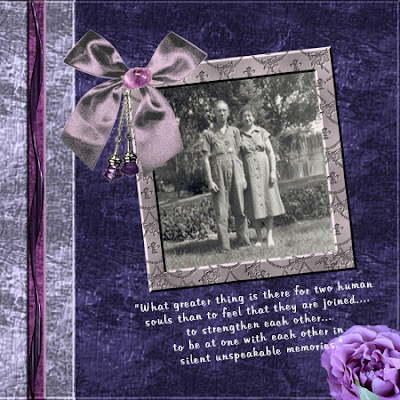 Tonight, I'll share my newest layout for the Scraplift Challenge at KST - see their link to the right of this page. The photos and the kit are mine. I love trying to photograph birds and wildlife. Hope you enjoy it. Tomorrow, I'll have a freebie for you. It's midnight, and I'm finally finishing up most of my homework so I can do some blogging. This won't be too long, but I wanted to share my layout for KST's ABC Challenge. This month, the letter is "B." Everything except the Bonnets, the picture and the wording came from Snow Raven's "Glow of Garnet" kit, which is available at "kutnkudlykreations". Their link is on the right side of this page. 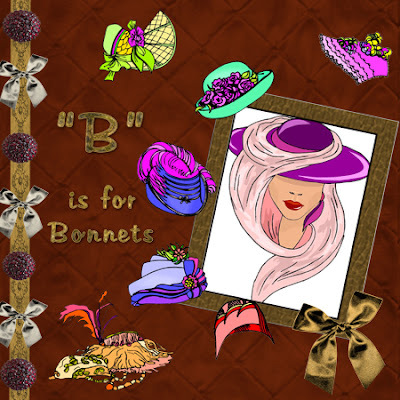 I chose Bonnets for my word, because I think hats can be gorgeous. The bigger and fancier, the better. My favorites are the big round picture hats loaded up with flowers and feathers. Maybe even stick a tiny little bird in there somewhere for good measure. Now I'm getting silly, so time for bed for me and Tootsie. Well, Tootsie's done with the chemo for another three weeks. She can breathe easy for a while. The nice part of these visits is the wonderful people we meet and their pets. It's so wonderful to see so many "moms" and "dads" being so loving and caring with their furry, feathery and scaly kids. It's been a long day, so that's it for today. I'm getting very forgetful lately (actually, more like usually lately). Tootsie had chemo appointments today, and I completely forgot. So we'll go tomorrow and Wednesday instead. I'm really going to have to work on my forgetfulness. My computer repair man came to fix my DVD writer drive, and gave me the sad news - I need to buy a new drive. So tomorrow, we go shopping. My PC is getting overloaded with all my scrapbooking stuff, and I need to back it all up on DVD's, and take it out of my PC. Tootsie and I are turning in now. Have to get up early for her appointment. Tonight, I'll share a layout made from Snow Raven's "Aquamarine Ambience." If you'll scroll down a bit, you'll notice that I've changed most of the elements to "Spring Is Coming." I wasn't too sure of the copyrights on a few of the resources that I had used to create some of the elements, so to be safe I re-made them. The last thing I would want to do is to misuse someone else's graphics. Thanks for understanding. I think you'll like the new elements. Tomorrow is a big day for Tootsie and me. We're going visiting - something we haven't done for so very long. Tootsie has her stuff all set aside for tomorrow -- Jacket, pink sweater, and new boots in case it rains or snows and a stuffed toy to play with. She is such a lucky little dog. We even have a pink stroller for when she's too tired or achy to walk. I have more homework to do, so that's it for tonight. I'll give you the links for Parts 1 & 2 for "Spring Is Coming." I'll probably post the link for Part 3 on Wednesday. Here's a photo of my Tootsie. I think I spoke too soon. Poor Snow Raven, she got her new PC all set up and there was something wrong with it. It has to go back to the store. I know how that feels, so I feel badly for her. Hopefully, the replacement will be fine. Mary Ann is home from the hospital today. In time, her hand should be pretty good, and she can get start scrapbooking. It was a long night and day, so this will be short. I'm going to post the link for Snow Raven's Amazing Amethyst QP. Enjoy it. Happy Valentines Day everybody. I got a couple of valentines, plus a home made one from a new friend in South Africa. Well, now --- ain't I special!! Has anyone been over to Snow Raven's blog yet today? She just got a new PC and what a beauty! Good luck with it Snow Raven. Last night, I meant to share with you a link sent to me by someone special. However, I forgot - so sorry- and I'll give you the link now. Get your tissues ready, and give your dog a hug, because there's nothing quite like your dog's love. Well, I finally finished the "Spring Is Coming" kit. I have so much respect and admiration for those guys and gals out there who design all those beautiful scrapbooking kits. I never realized how much work went into their designs. When you're out there downloading all those freebies, don't forget to say thank you to the designers. That's all for today. 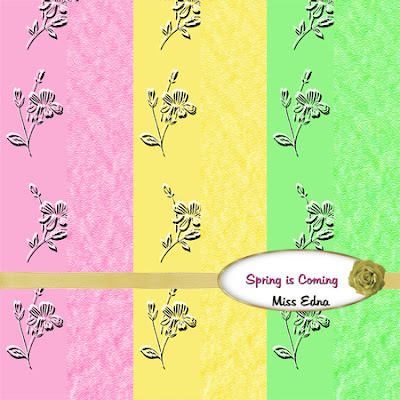 I'll share with you the preview for the elements to "Spring Is Coming." One more day till Valentines Day!! Actually it's only a few more hours away. Are you ready? 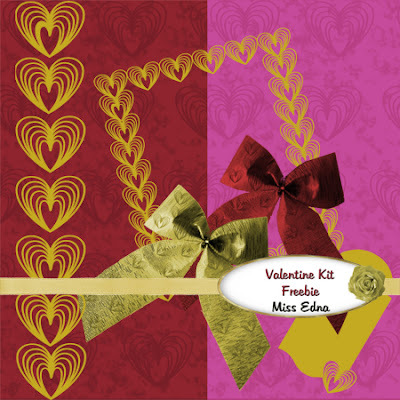 Got your valentines and hugs and candy for your special person? And the best part -- Spring is only 5 weeks away. Yeah-h-h! Today the winds died down, and for a change we're starting to feel warmer. It's been so cold. Although I shouldn't complain. I have a friend who lives where it is 40 and 50 below zero with the wind chill factor. God bless her, I don't think I could cope with that. Designing is not as easy as it looks, so I'm learning. I have to make a hundred papers to get six that I would actually give away. So that is what I accomplished today. 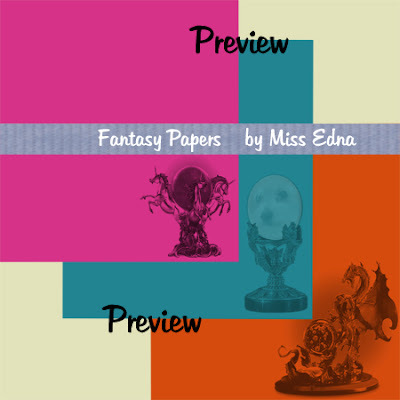 I will show you the preview for the papers to the new kit I am making for you. 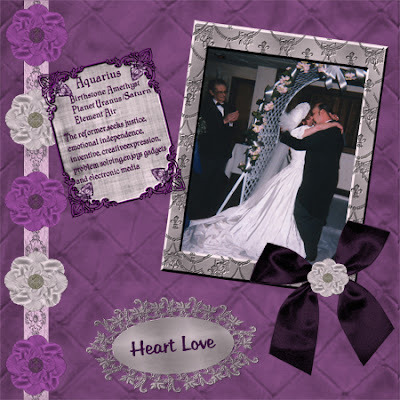 I'm also going to share a layout made with Snow Raven's new kit "Amazing Amethyst." Check the stores listed at the right, because it should be out this week. 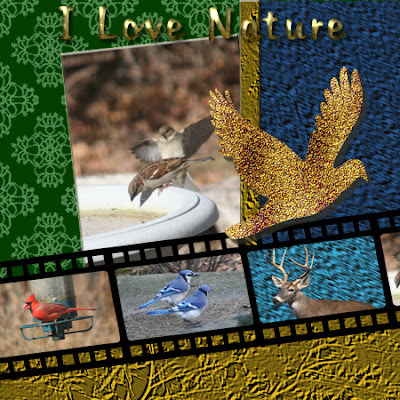 If you like this layout, I will be posting the Quick Page for you this weekend. I will also be posting a link for the first part of the "Spring Is Coming" papers. It is a large download, so I broke it up into two parts. Before I start chatting, I want to wish my friend, Mary Ann, good luck for tomorrow. She's going in to the hospital for surgery on her hand. Here's hoping, Mary Ann, that in a few weeks, you'll be pecking right along on the keyboard. On a lighter note, I thought I would share a layout that I made for a challenge at KST. This one's for you, Artie. 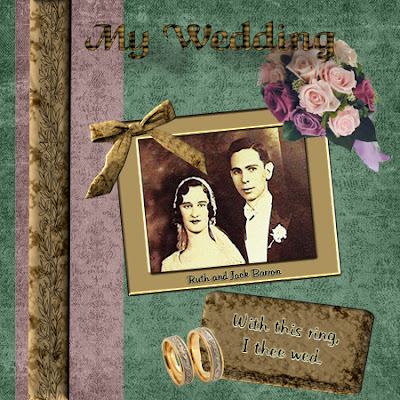 I have another layout to share, made with Snow Raven's kit "Sarah's Wedding." This was also made for a challenge at KST. 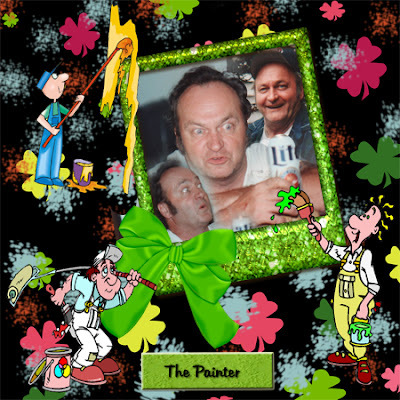 If you're reading this, Edie, I hope you like this one. I've been busy today working on homework. Somehow it never seems to actually get finished. But I'm not complaining. Look at all I'm learning. As a matter of fact, tomorrow, I'll share some of the new things I've been making. Maybe I'll make a little freebie kit for you. That's it for tonight. Tootsie and I are off to dreamland. Another good day, today. My Cbox finally works. I was beginning to think I was alone out here in cyber space. Tonight I have two pictures to share. This first one is very special to me. When I was young and struggling along, My Mary was always there to help me. Sometimes I feel she's still watching over me. The swirls and the gemstone come from Sherry C's Creations, and the rest is mine. One day, I was watching an icicle melting. 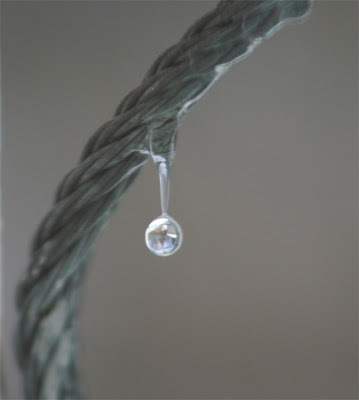 Each drop of water would drip down onto a piece of cable and roll down a bit. As soon as it was heavy enough, it would drip off the cable and fall to the ground. My curious little mind thought "Hm-m-m-m, I wonder if I can take a picture of the water drop just as it was getting ready to fall to the ground." Well, this is what I got. That's it for today. Another long night tonight. But then again, I can finish all my homework. I made a lot of new papers, which I'll share with you soon. Have you ever noticed what wonderful people your siblings are? Most of the time, you just take them for granted. But -- when a crisis comes along, your siblings come to your rescue. I only have one sibling, but I'm very thankful for him. He helps me with my daily chores, my shopping, cooks me a nice hot dinner most nights, and so much more. I don't think I tell him very often how much he means to me, so if you're reading this, Artie, I love you. Tonight's an extra long shift, (14 hrs) so I won't chat too long. 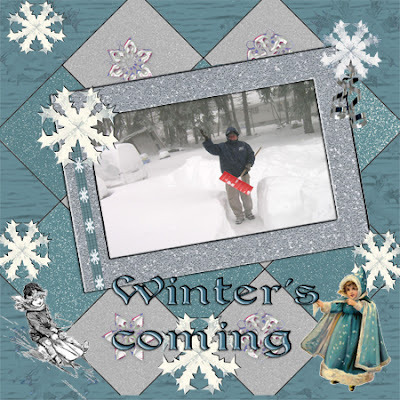 Tonight's layout was made with Snow Raven's kit "Winter's Coming." And guess who's shoveling us out. You got it!! My brother. I gave myself quite a scare today. My camera turned up missing, and I was in a tizzy all day until we found it. It was right in plain sight, hiding behind something. I looked in at Snow Raven's blog this afternoon, and my head swelled up with all the nice things she said about me. Thank you, thank you, Snow Raven. This weekend, I will have to work on some new free stuff, plus I need to spend some time with my homework assignments. 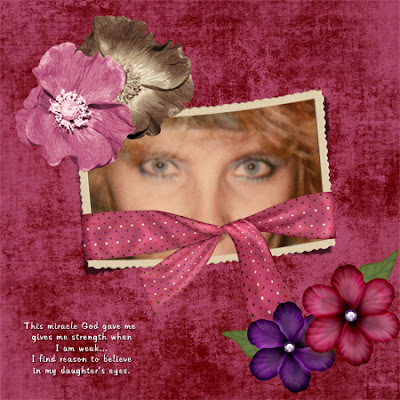 I am signed on to three different types of classes; the scrapbooking classes with Snow Raven at KST, Photoshop Classes at GDS, and my Photoshop Workshop at "thelittlephotoshop" forum. 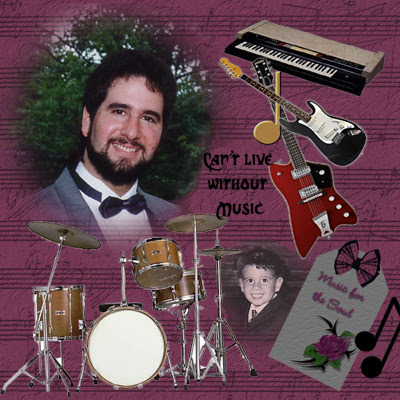 Tonight, I'm going to share a layout with you that I made for a friend of mine. 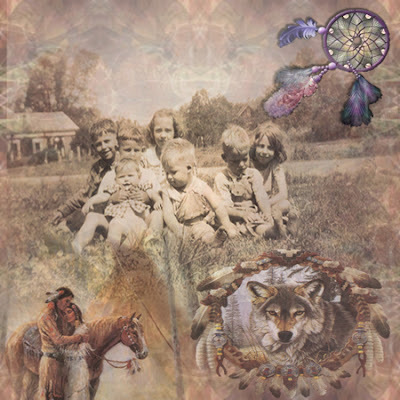 It's quite nostalgic, and incorporates jinto it her love for Native American lore. The wolves and the teepee came from "Jenny's Scraps" and the Native American elements and background came from "Sherry C's Creations. The photo used is from my friend's childhood. This one is for you, Miss Bea. Well, today we finally got the big hole in the drain pipe fixed. Now we just have all the mess to clean up. BUT, the water is back on. Enough of the gory stuff. 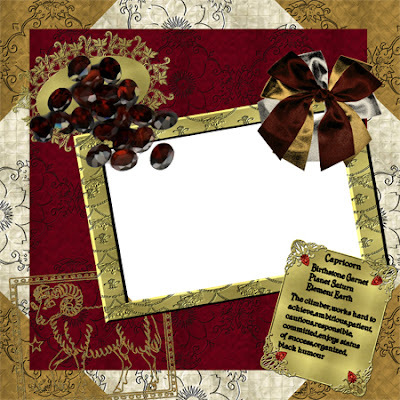 Snow Raven has just released some new Birthstone/Zodiac Kits. There's "Glow of Garnet", "Amazing Amethyst" and "Aquamarine Ambience." So go to KST (Designs for Kristen) and have a look see. The link is on the right side of this page. The new kits are really nice. Tonight, I'll share with you a layout I made with "Glow of Garnet". The colors are just stunning. Today's post is short, but this layout will make up for it. I'm excited today. 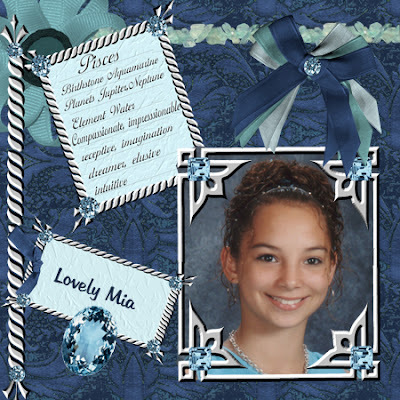 I made my first scrapbooking kit and it came out pretty good, if I must say so myself. This is one addictive craft. I'm getting better though. I didn't burn any meals while I was making this kit. I get so engrossed with what I'm doing , that I forget about the food that's cooking on the stove until I smell the smoke. Today, I got smart -- I had sandwiches. Can't chat too long tonight, I still have homework to do. So here's a preview of my very first Freebie. If you would like this kit, here is the link. Expired. I signed up for a 12 week Photoshop CS2/3 class, and today I got my first assignment. If anyone is interested in taking these kind of classes, check into it at GDS. When I finish the Beginner's course, there is a Medium and an Advanced class. Hopefully, by the end of all of them, I'll be a pro. If you buy that, I have an ocean complete with paddle boats out back here for sale. BUT, I will be better. I also take classes from Snow Raven. Right now, we're working on papers and textures. In my spare (?) time, I work on my personal papers. I'll leave you a sneak peek today of what I am working on. You know how things usually come in threes? Well, today my #3 happened. First it was my tires, then my roof, and today we had to call in a plumber because a pipe corroded and a big hole burst out of it. Yup, you got it!! Tomorrow he gives me the sad $ news, and comes to put in a new pipe. Meanwhile, we had to shut off a lot of the water, and throw tons of kitty litter all over the cellar floor to help mop up the watery mess. It took most of a 2 gallon jug of disinfectant to help cover up some of the stink. Whew! I'm getting tired just thinking about all of this. Here is the sneak peek I promised you. Did anyone watch the new "Miss Ground Hog" on the news last night? She had a shadow, so there's six more weeks of winter left. 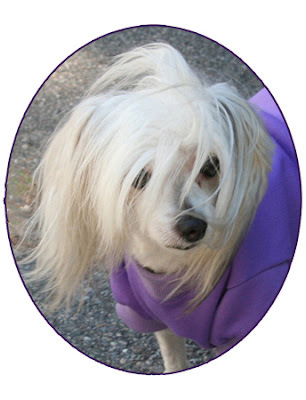 Can you imagine just how many people come out to stand around and watch a little fuzzy creature meander around in the park looking to see if it has a shadow? Amazing! On a brighter note, our cold spell has broken for a bit. Today is really quite nice, thank you. In Photoshop workshop, we're working on textures and patterns. So all the way home this morning, I've been looking at everything differently. Nature has thousands of textures and patterns if we only know how to look for them. The clouds, trees, fences, fields, animals........of course, I didn't have my camera with me. Duh! I'll try again tomorrow. Only this time, I'll remember to have my camera with me. One more thing -- this is a great time to start doing your 2008 Birthday/Christmas/Holiday shopping. I've already picked up four things to put away for Christmas. Now if I could only get all my birthday and anniversary cards finished, I'd be a happy little camper. Maybe that could be my project for tomorrow. Enough....time for my beauty sleep. Today, I'll share a photo that I took of the Temporary Fore River Shipyard Bridge. I had to take several photos and seam them together. Here's another photo that I like. 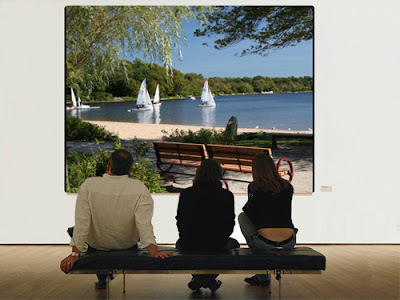 I used a PS action to set my photo in an art gallery. This is so neat! A word to the wise. Never ever go to your doctor's office in the wintertime unless you're seriously sick. Yesterday, I went for my semi-annual do-you-remember-me check up. I went in feeling fine and dandy, not a thing wrong with me. On my way out, I noticed a little boy running all around the waiting room coughing and sneezing really bad. This morning at 1:45 am, I woke up all stuffed up with a nasty head cold. I was cold and I've had the chills all day. Think I caught somebody's nasty little cold? From here on, I'll schedule my "let's get acquainted" check-ups in mid-Spring and October. Or better yet, once a year in July. Today, I got my two new tires for my car. When I saw the bill, I asked my mechanic if the tires were lined with gold. He told me "no, they're lined with platinum." On the bright side, we got a lot of rain today, and that helped to fill up the empty ponds and lakes a bit. I need to go get my beauty ?? sleep now, so I'll share another layout. This one was made with Snow Raven's kit "Midnight Symphony." 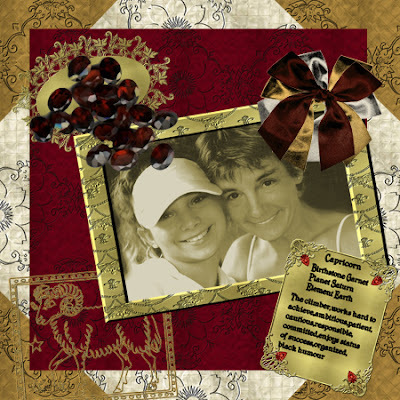 All of these kits are available at Kristen's Scrap Trunk and Kutnkudly's Kreations. Their links are on the right side of this blog.